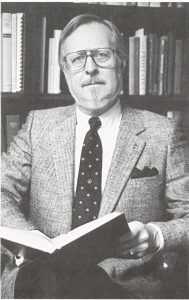 Fred Barge was a leading philosopher of chiropractic and authored several important books on the topic. 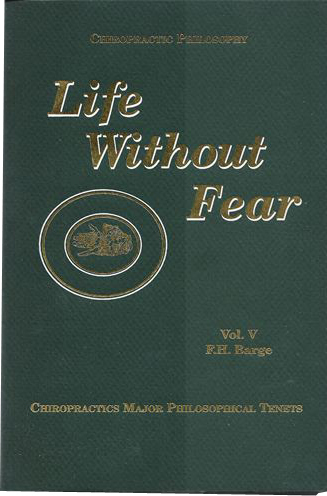 President Barge Chiropractic Clinic, S C.
This paper states that the “true chiropractic philosophy” was created by the founder, Dr. D.D. 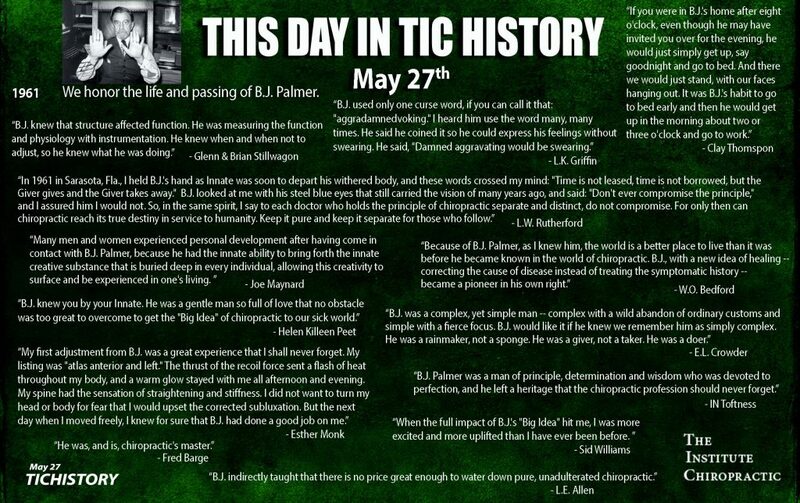 Palmer and that the basic premise of chiropractic and its major tenets are clearly defined in the founders early writings. 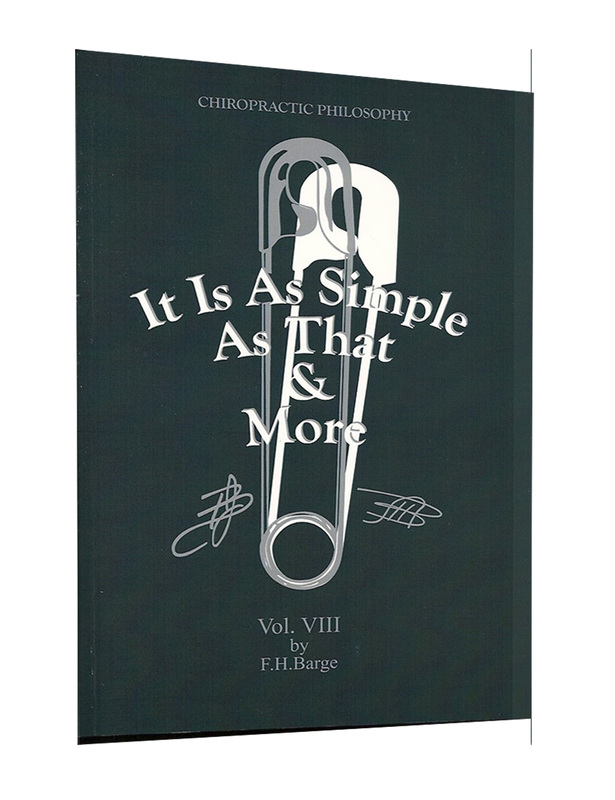 Herein one sees the unique and singular health care philosophy that distinguishes chiropractic from aIlopathic medicine. This non-therapeutical approach to disease stands out succinctly as antithetical to the medical paradigm. Citing authors such as Drs. D.D. Palmer, B.J. 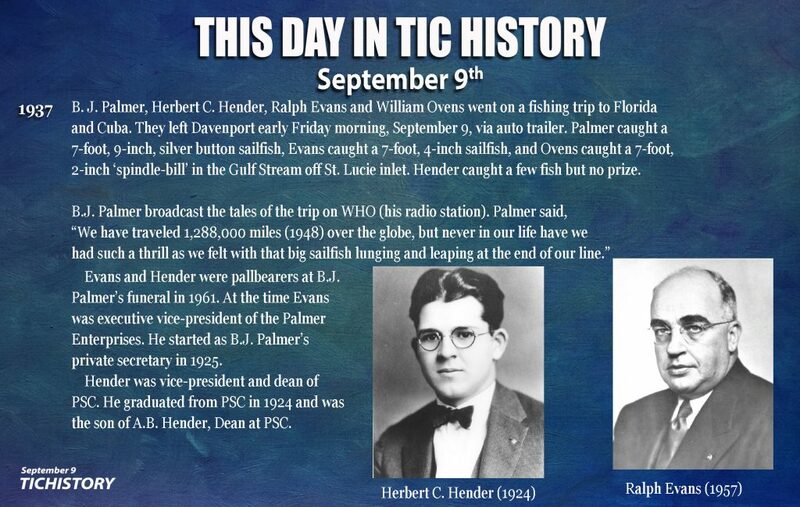 Palmer and R.C. 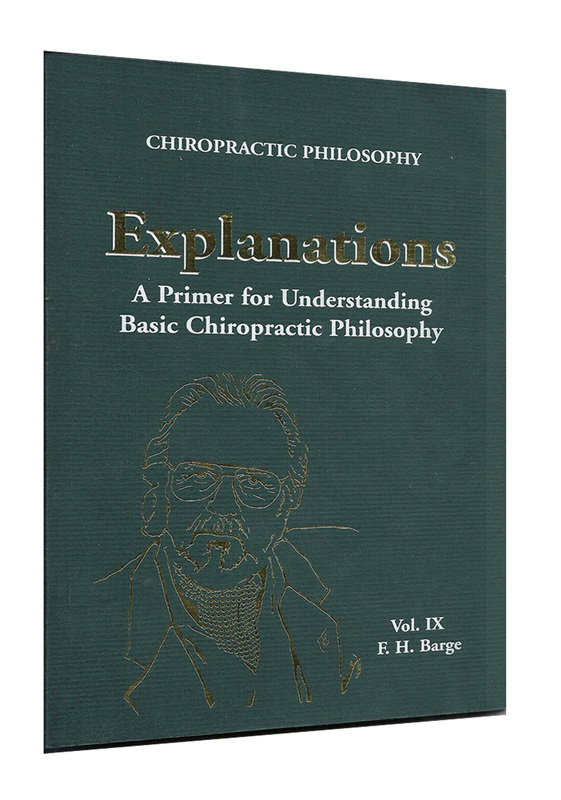 Schafer, the non-therapeutic and non-medical concepts of chiropractic’s unique paradigm are explained. Differing concepts of diagnosis are addressed in the light of each profession’s responsibility to their own form of health care. Regardless of the fact that some students of D.D. 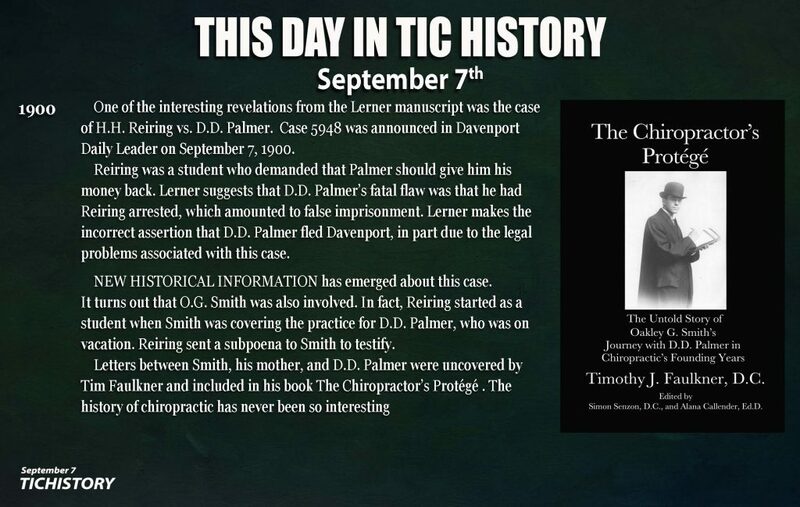 Palmer practiced the established medical therapeutic model and simply added the “adjustment” to their many “treatments”; and regardless of the fact that these Doctors created schools that still exist today teaching therapeutics along with the chiropractic adjustment, there is only one true chiropractic philosophy. This philosophy was irrefutably established by the founder in his school and his writings. The chiropractic approach in health care is foreign to medical concepts and cannot exist comfortably within the frame work of the medical paradigm. Chiropractic is non-therapeutical. This is the one clear distinction between chiropractic, allopathic and osteopathic medicine. The continued existence of chiropractic as a separate, distinct, non-duplicating alternative to medical care, depends upon the profession’s ability to sustain and ameliorate its unique non-therapeutic principles and philosophy. 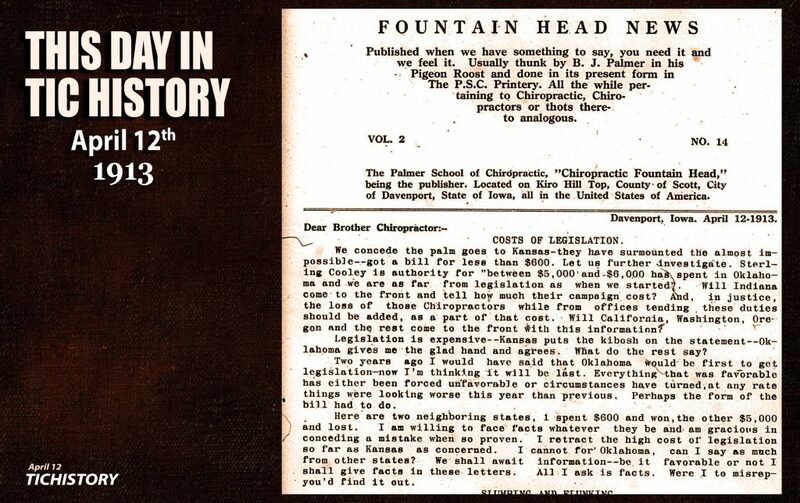 THE HISTORY OF chiropractic reveals a persistent dichotomy that must be initially addressed before the history of what is truly chiropractic philosophy can be discussed. 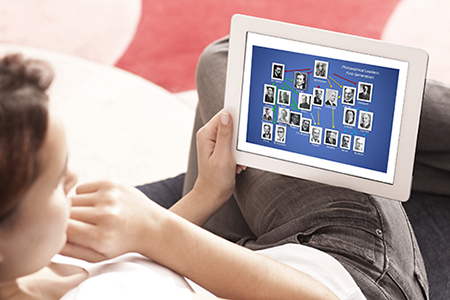 Early chiropractic writings clearly reveal that which was truly new and unique chiropractically was laid down by the founder of chiropractic, D.D. Palmer, and his son, B.J. 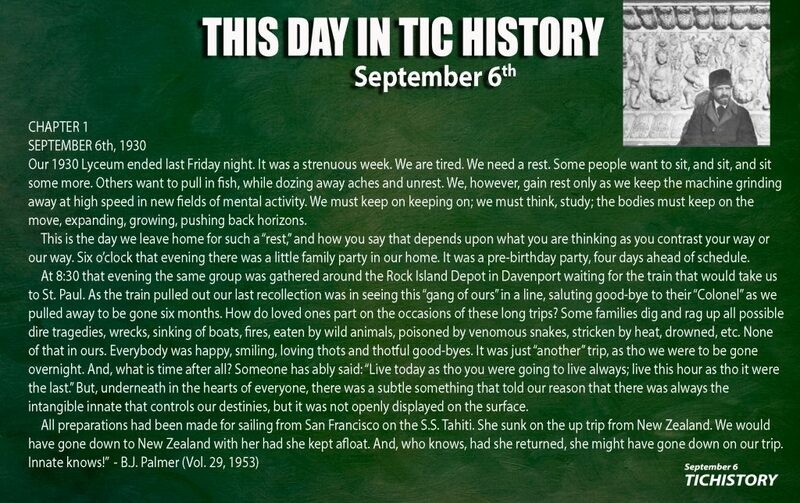 They and they alone brought forth something singularly new upon the health-care scene at the turn of the century. 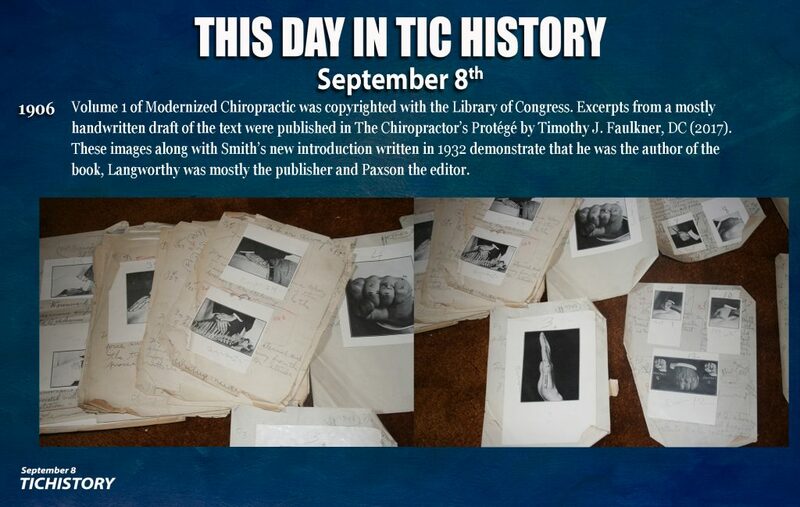 From his accomplishment of the first chiropractic adjustment in 1895 to the subsequent publishing of his 1910 text, D.D. 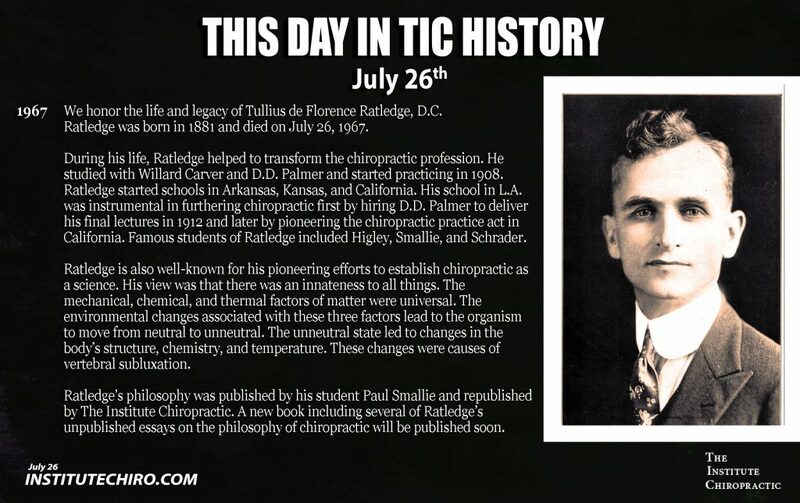 Palmer originated a philosophy of chiropractic that rapidly evolved into a distinctly non-thera-peutic healing art, i.e., chiropractic es-not treat disease. It is totally understandable that practitioners of other healing arts, as many of D.D. 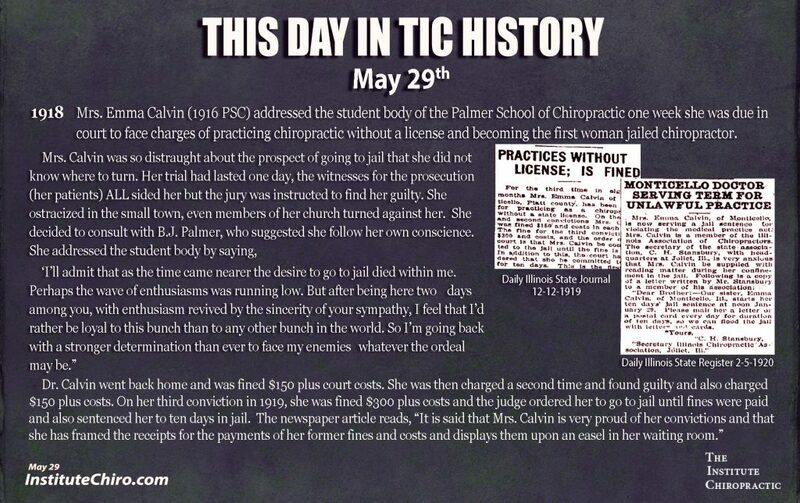 Palmer’s first students were, would not simply drop all the methods they had employed and practice only the art of spinal adjustment. They had been trained in the treatment of disease, and they simply included the adjustment as a manipulatory procedure in their armamentarium of disease treatment modalities. They followed in the medical model of the healers of their times who employed the “outside in” disease treatment concept that had persisted for centuries before them. 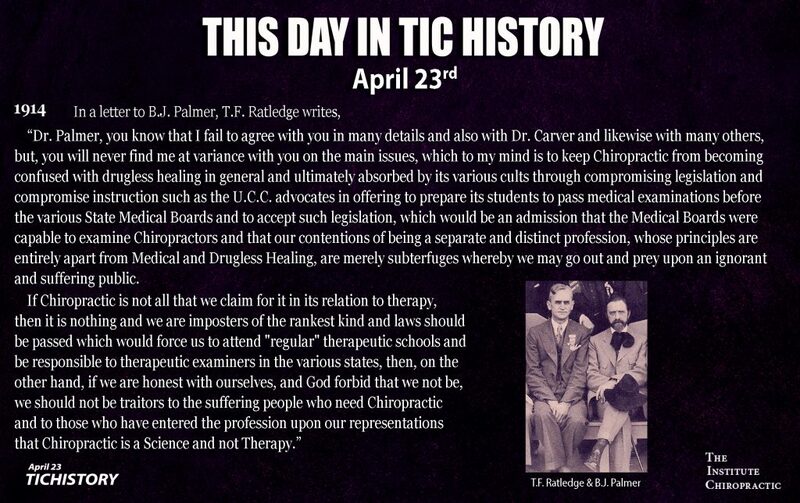 At first, the distinction between those who practiced “mixed’ therapeutics and those who followed the Palmer chiropractic philosophy was not very clear. Most chiropractors focused strongly upon the spinal adjustment, and early state laws confined chiropractic to this realm of care. The public soon became aware that chiropractors adjusted the vertebrae of the spine for spinal misalignments, called subluxations. 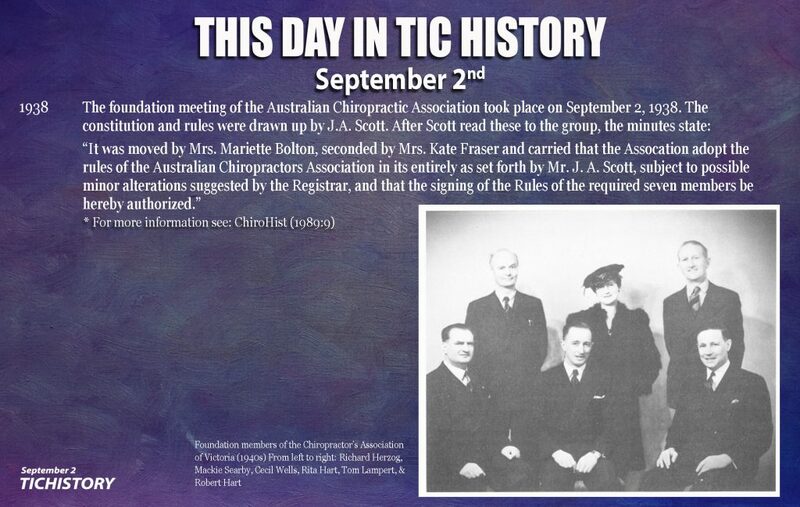 But, as time went on, the influence of those who practiced mixed practice obfuscated the identity of chiropractic until, increasingly today, public confusion exists as to what chiropractic practice really is. Presently our colleges are very close to being evenly split on the teaching of each form of practice. Approximately 50 percent teach a subluxation-based, non-therapeutic, “Palmer” chiropractic practice and philosophy. The other 50 percent follow an allopathic model, teaching an eclectic regimen of disease treatment therapeutics. They include “spinal manipulative therapy” as one of the modalities they use, along with numerous other disease treatments legally allowed by the various state laws. 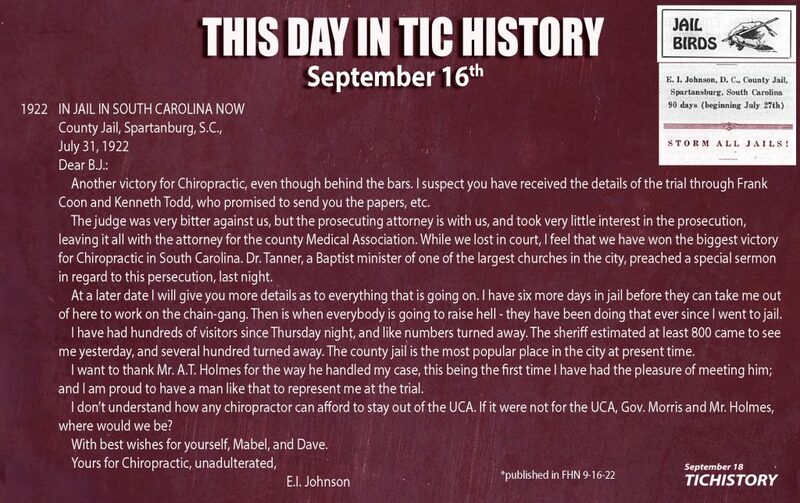 Such a stance decrees that chiropractic is that which state laws allow it to be. 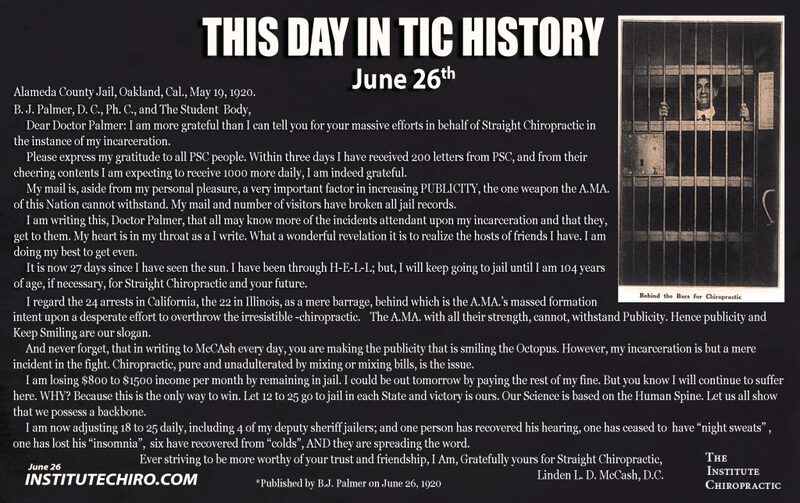 To this, Dr. Donald Kern, the immediate past president of Palmer College of Chiropractic, said, “Chiropractic is, regardless of what 50 state laws say it is!” And I heartily agree. Certainly chiropractic is not an eclectic hodgepodge of therapeutic disease treatment modalities. 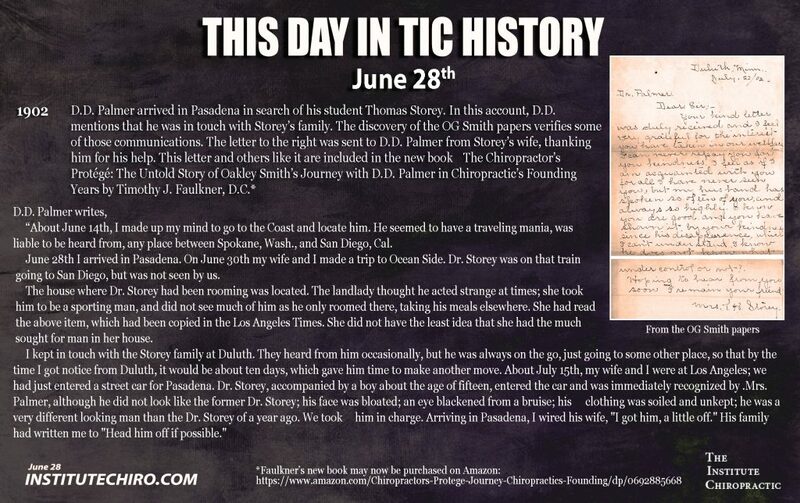 The study of the Palmers’ writings has been an ongoing interest in my life ever since my father read to me as a boy from D.D.’s 1910 text, The Chiropractor’s Adjuster. It is apparent, from this book and in writings prior to 1910, that D.D. 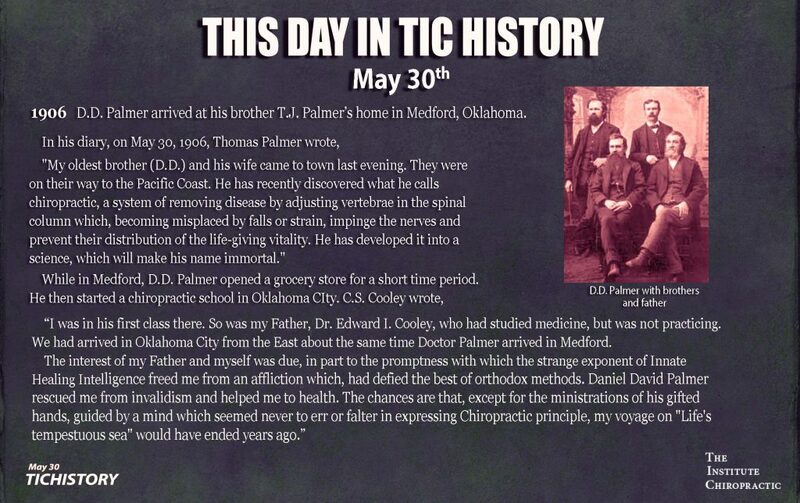 Palmer’s chiropractic philosophy evolved quite rapidly in the less than two decades he lived after founding the chiropractic profession (1905-1913). 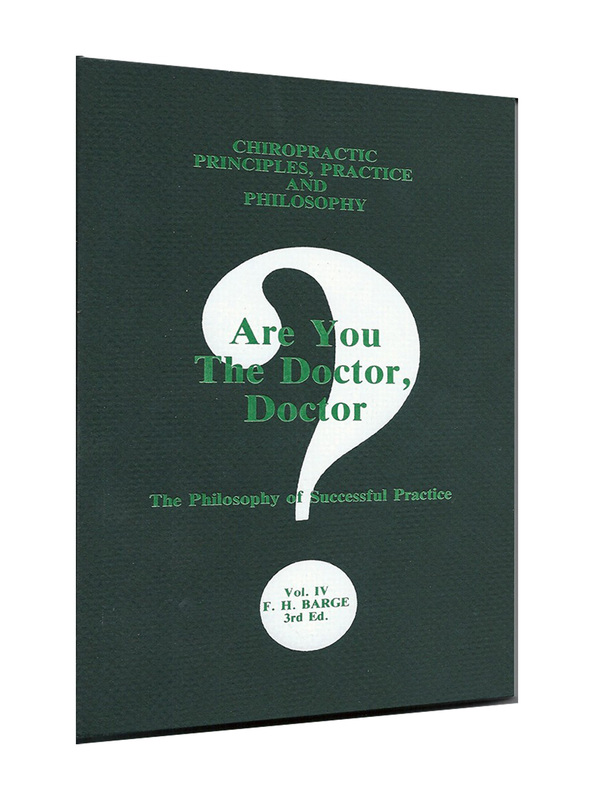 D.D.’s last book, The Chiropractor, in 1914, was a collection of his essays published posthumously. I do not place much credence in the contents of this text, as he may never have published it in the form that we find it today. Writing is rewriting, and D.D. Palmer did not approve the final draft. Having explained the difference between the two forms of practice within chiropractic, I will focus on what is truly the philosophy of chiropractic by looking at writings from D.D. 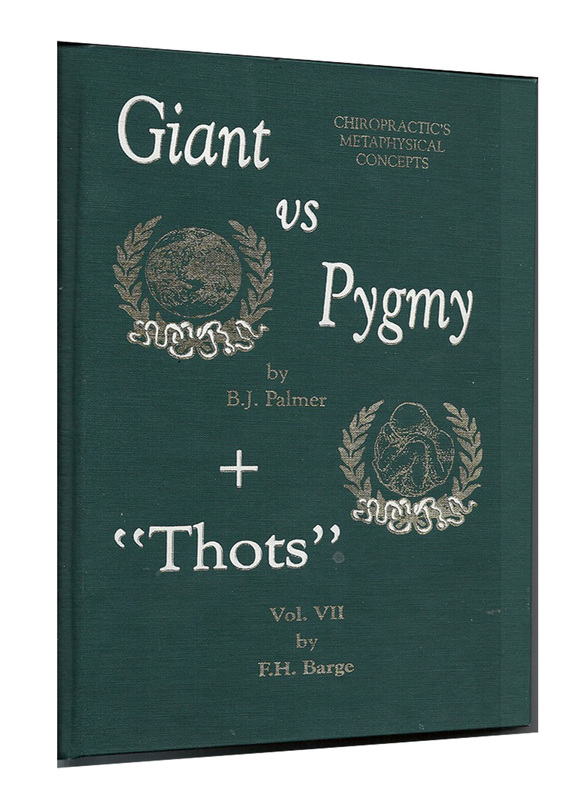 Palmer, his son B.J., the early authors of the Palmer School of Chiropractic‘s “Green Books,” through the “Thots” of Drs. 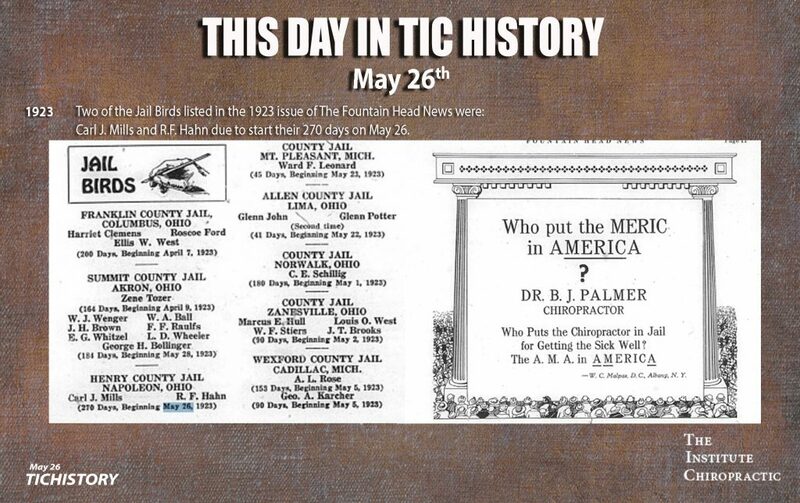 Galen Price, Marshall Himes, E.L. (Bud) Crowder, Virgil Strang, Sid E. Williams and others. Prior to the first chiropractic adjustment, D.D. 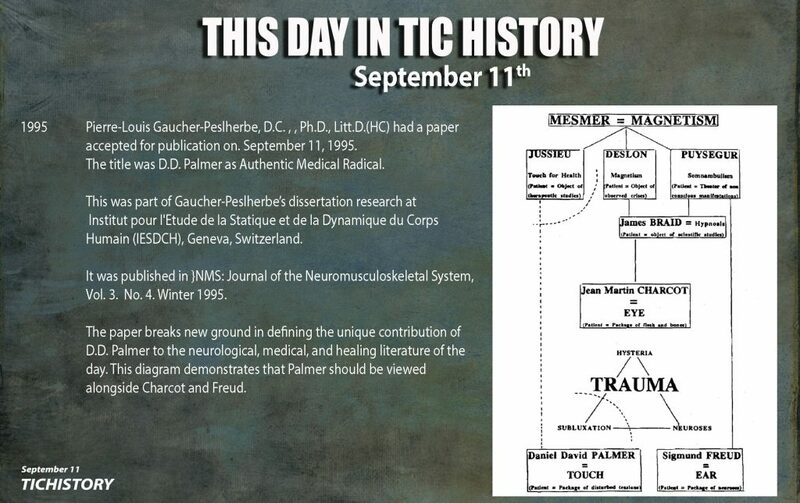 Palmer practiced a metaphysically based form of healing, and he referred to himself as a magnetic healer. Magnetic healers were quite prevalent at the tum of the century; essentially, they believed they could project their life force into a patient and heal them. However, D.D. had a unique approach; he was “specific.” He would locate the area of problem in the patient’s body and with his hands project the healing force specifically into that area. 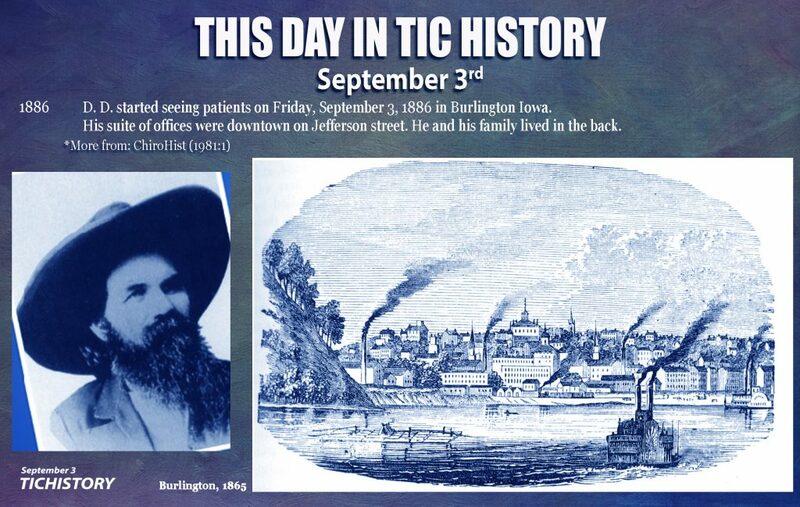 He claimed he could cool the inflammatory process that caused disease. 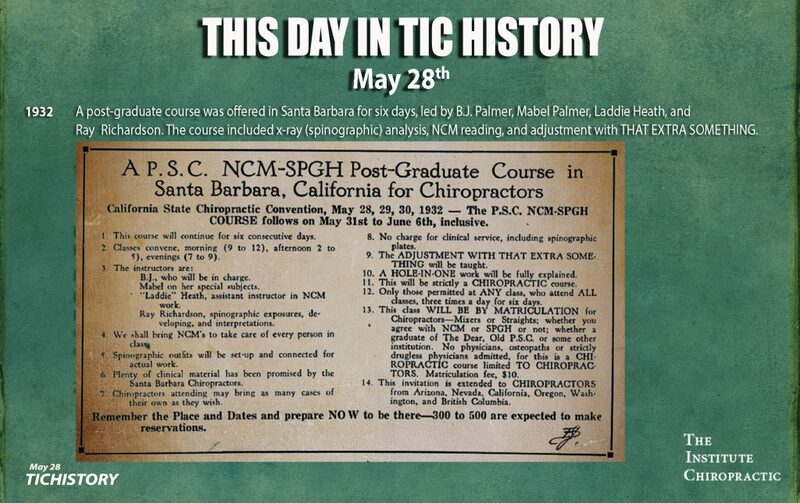 Thus, we can see that this singular “specific” approach began before the adjustment of Harvey Lillard and carried on into the lexicon of chiropractic. But the adjustment of Lillard brought with it a new concept in D.D.’s thinking. Something was out of place in Lillard’s anatomy. Something was out of place in the “human machine.” D.D. found the problem and righted what was wrong, and the man’s hearing was restored. The adjustment led D.D. Palmer to briefly abandon his metaphysical roots, and his “man the machine” era came into being. In his newspaper format periodical, The Chiropractic, published in 1899, he stated: “When all parts of the human machine are made to work without friction and all obstructions are removed, then nature will bring strength and health. 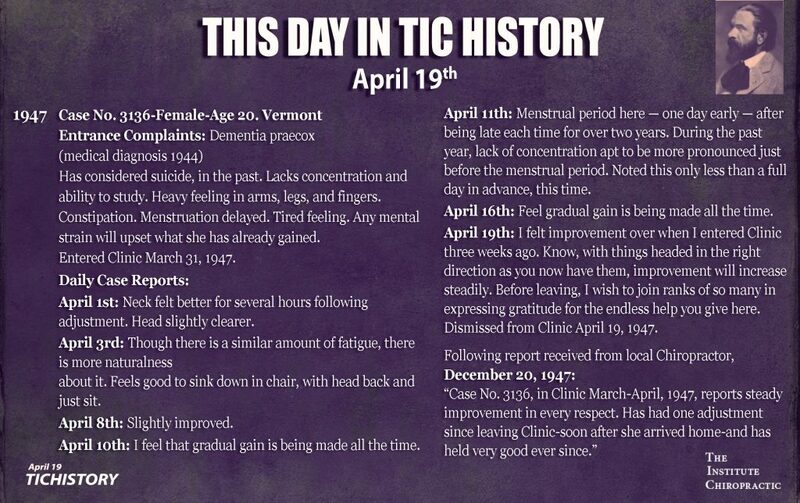 But by 1903, D.D. already had abandoned the word treatment, which he used frequently in his “man the machine” era. Manipulation was replaced by adjustment, and chiropractic care was fast becoming completely non-therapeutic. 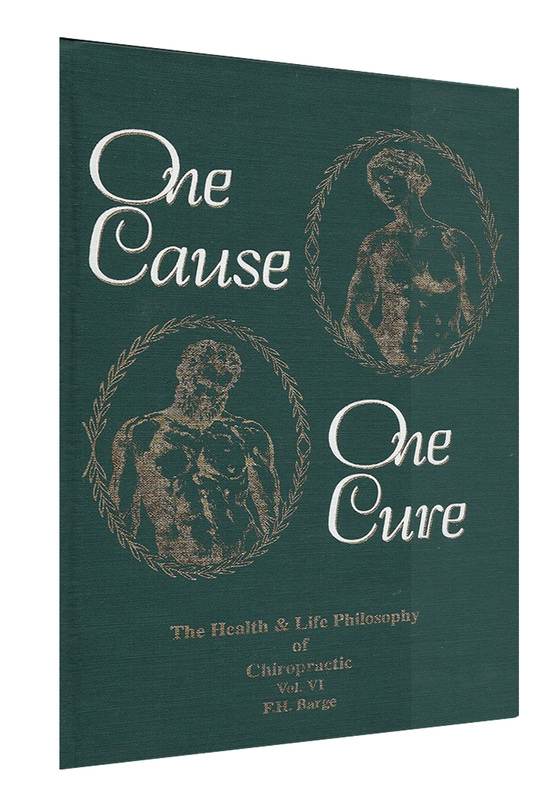 Even before the first Palmer book was published in 1906, his metaphysical concepts of Universal Intelligence, Innate and Life Force found themselves at the root base of his chiropractic philosophy. Thus, we can see that D.D. Palmer had only a brief period of time wherein the mechanistic approach dominated, and even then, vitalism was apparent throughout his teachings. But the “man the machine” era had its purpose. 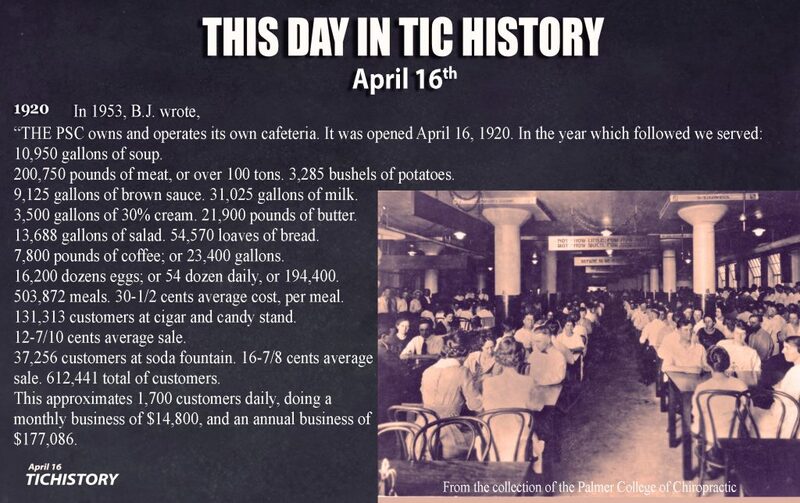 It had brought forth a reason for people being sick. It was a problem on the inside, not the outside. 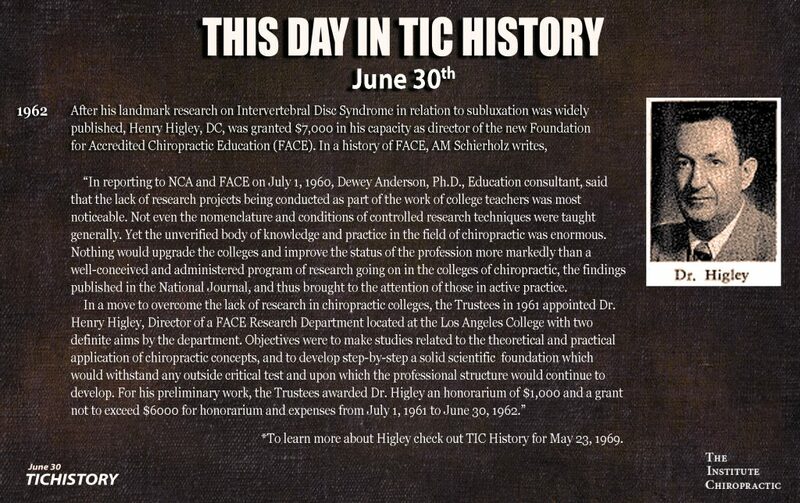 With this concept, so foreign at the tum of the century, he brought forth chiropractic’s nontherapeutic stance. He united the concepts of life force with a physical presence that denied this force its expression — the vertebral subluxation. What exhilaration he must have felt to finally explain to himself that which he always sought! With the discovery of the subluxation, he had found the answer. 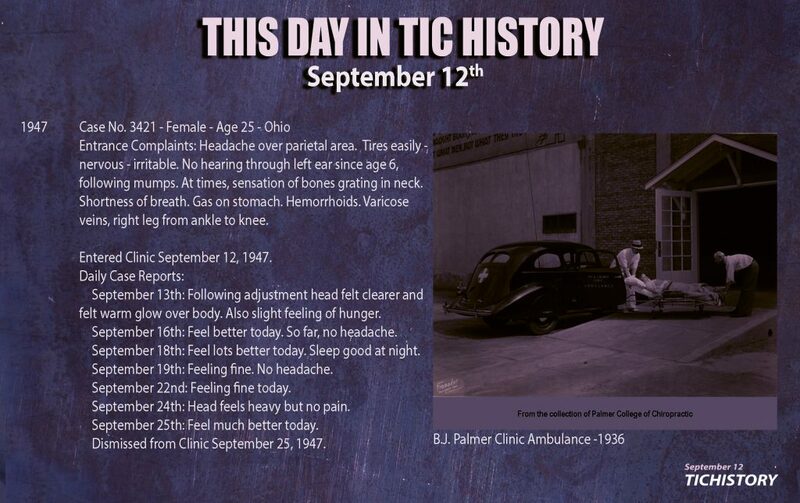 This was the discovery that was truly chiropractic. 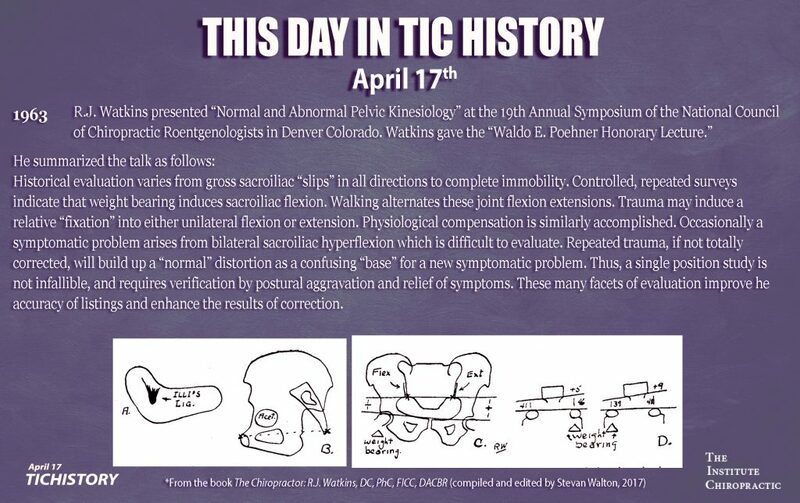 It was not another therapy for disease treatment, but the location and adjustic correction of the cause of malfunction and its resultant dis-ease — the vertebral subluxation. To those who follow in the chiropractic concepts of the Palmers, it certainly had as much “meaning” as the discovery of the pulse. 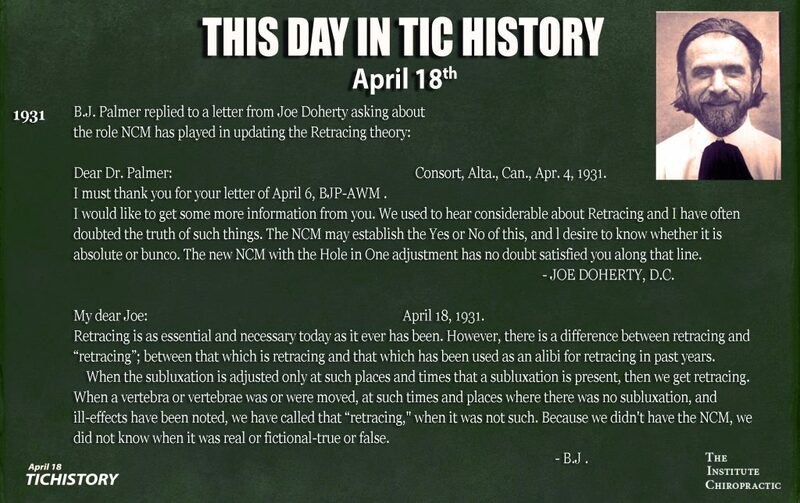 The “adjustment” of the subluxation was truly somethlng new, as we must remember that during D.D.’s era there were many manipulators who aimed to right what was wrong but not specifically. 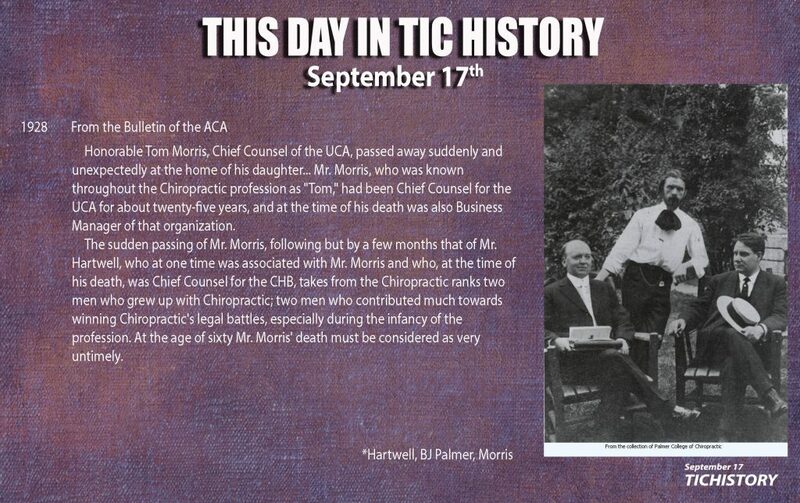 A.T Still founded osteopathy 21 years before D.D. adjusted Lillard, and manipulation was commonly practiced by 1895. So, you see, for himself and for chiropractic, he believed that he had unlocked the secret of life, heal! . death and disease, and he hoped we would “lift the veil” to what lies beyond. D.D. 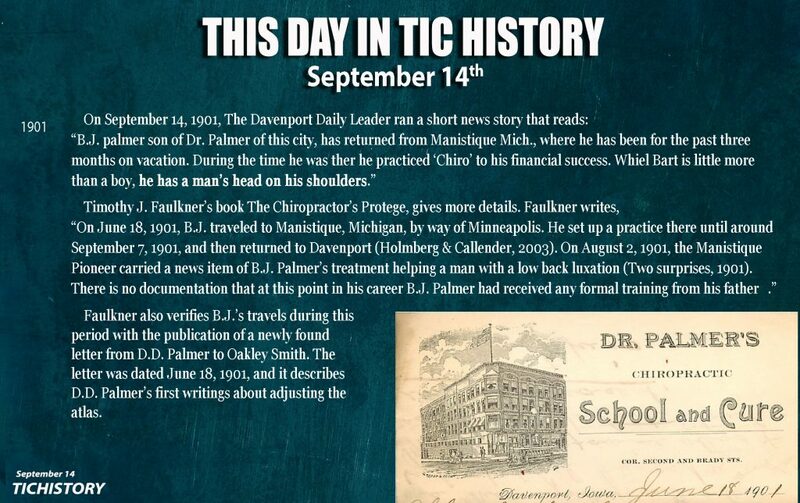 Palmer’s short life, as the “magnetic healer,” the “magnetic manipulator” and the first chiropractor, saw him bring forth the rudimentary base for something revolutionary upon the healthcare scene, and he named it chiropractic! He had united the life force and the physical, and he corrected any interference between the two with the adjustment of the vertebral subluxation. Through chiropractic philosophy, he explained how this life force restored health, life and well-being. The subluxation interfered not only with health but with Universal Intelligence’s expression in man through man’s Innate Intelligence. 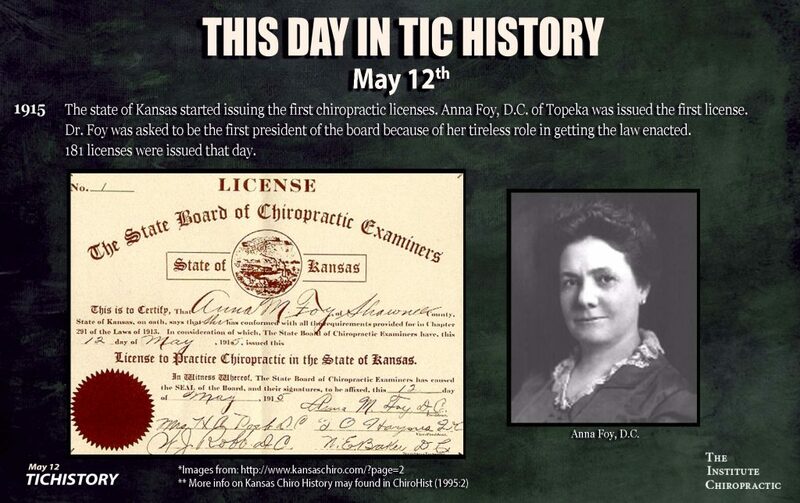 Thus, the concepts of body, mind and spirit were brought into chiropractic philosophy. Chiropractors did not treat disease; rather, they removed the obstruction to healing, allowing the body’s spirit, the Innate Intelligence, to provide the treatment. This was the new philosophical concept, the non-therapeutic stance. D.D. 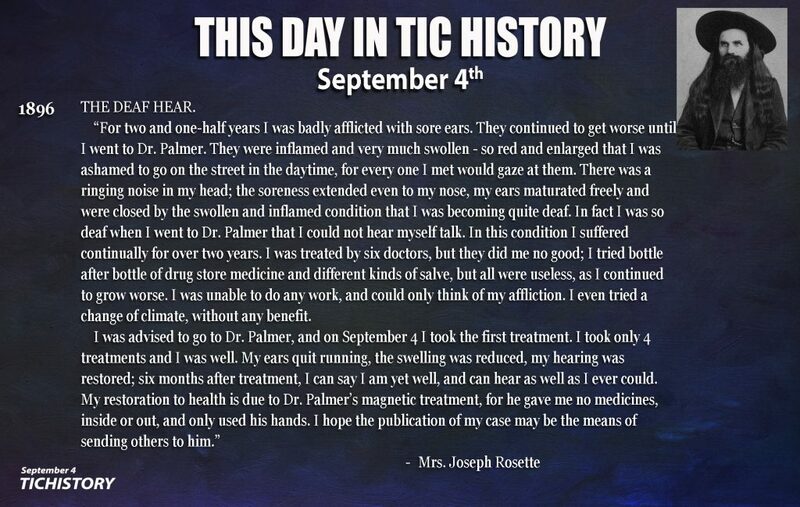 Palmer was very clear in what he had brought forth, and it was not disease treatment therapeutics. After D.D. 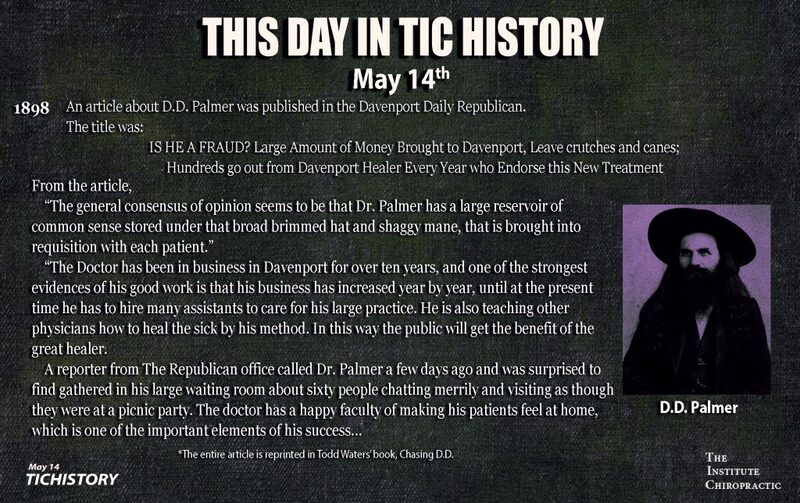 Palmer was jailed for practicing medicine without a license, he served part of his sentence, paid his fine and left Davenport, Iowa. However, he had provided for his son B.J. 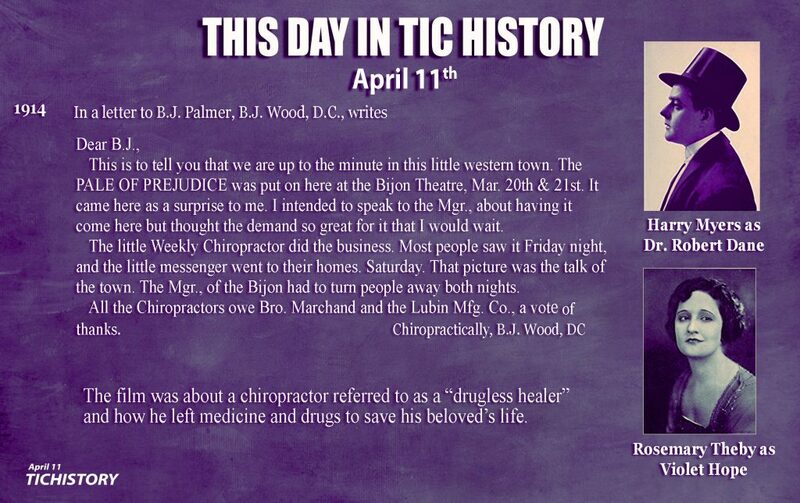 the concrete foundation of chiropractic, and B.J. Palmer built upon it very well indeed. 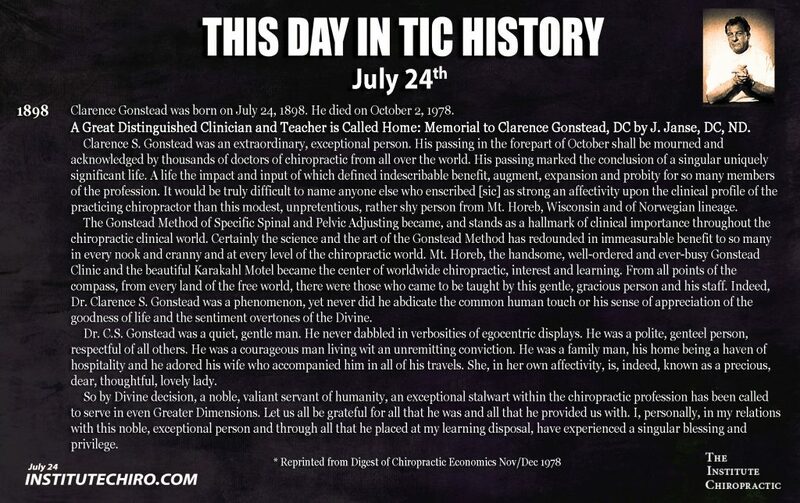 He ameliorated the spinal adjustment concepts of his father and developed the full philosophical concepts of Universal, Innate and Educated Intelligence. 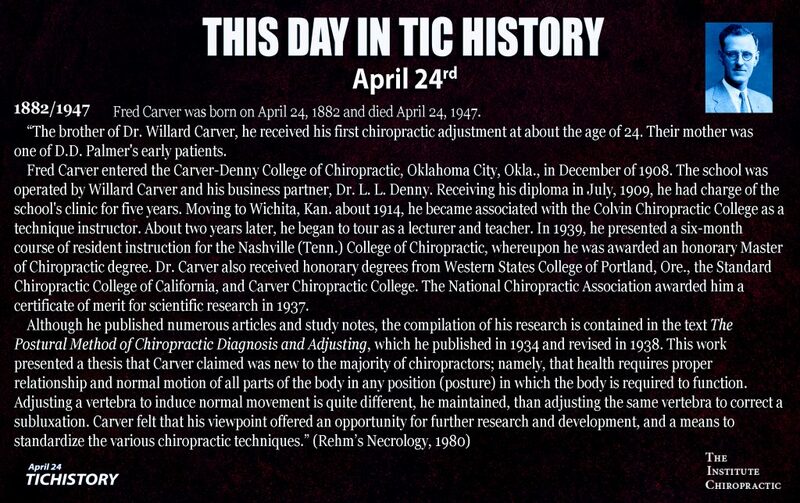 He created the “Above Down, Inside Out” philosophy, the “God in Man” principle, and the “Big Idea” of chiropractic. B.J. 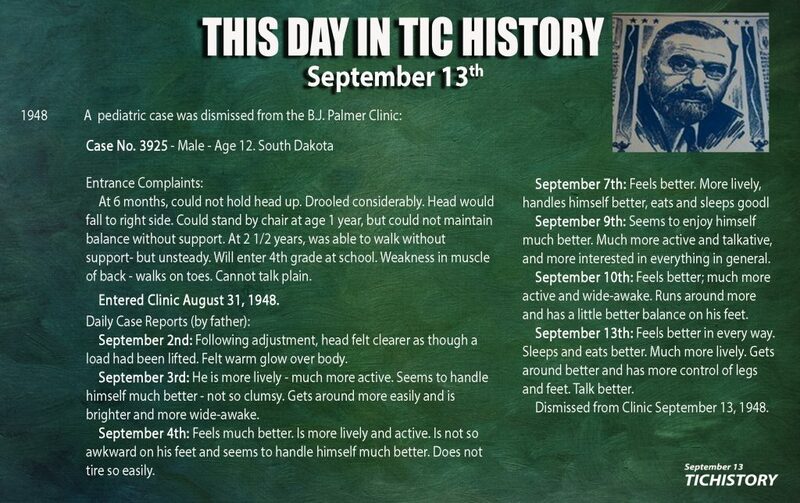 Palmer entered the chiropractic scene with all of the vigor only youth can muster. 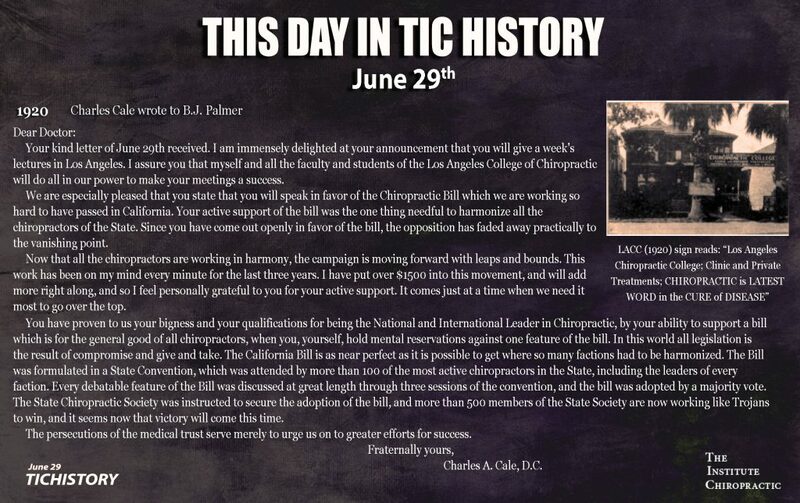 Saddled with a debt-ridden institution, the Palmer School of Chiropractic, he stood alone at the helm of the fledgling profession, and he was responsible for both the growth and prosperity of the school and chiropractic. After losing his right to practice in Iowa, D.D. 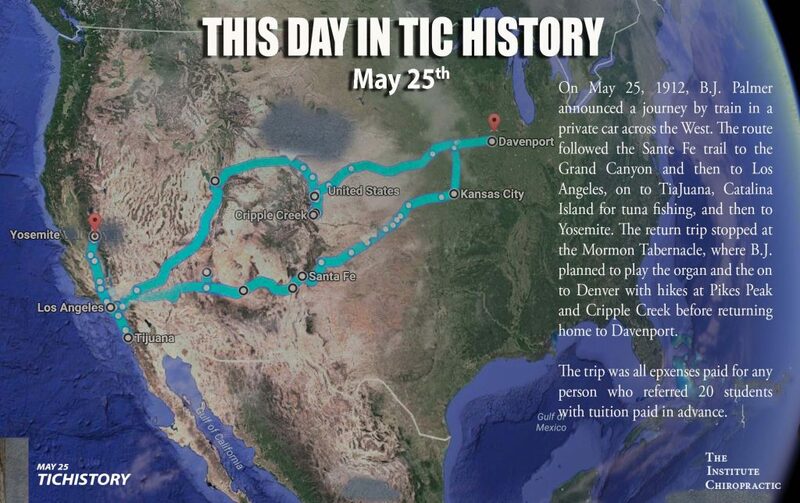 had left and endeavored vainly to start schools of chiropractic elsewhere. 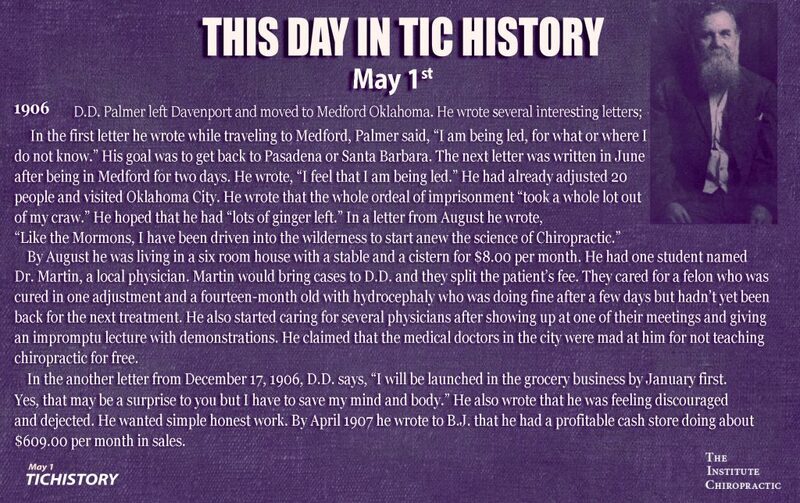 Perhaps his rage was mainly due to jealousy toward his son, rather than for stealing chiropractic as he claimed. 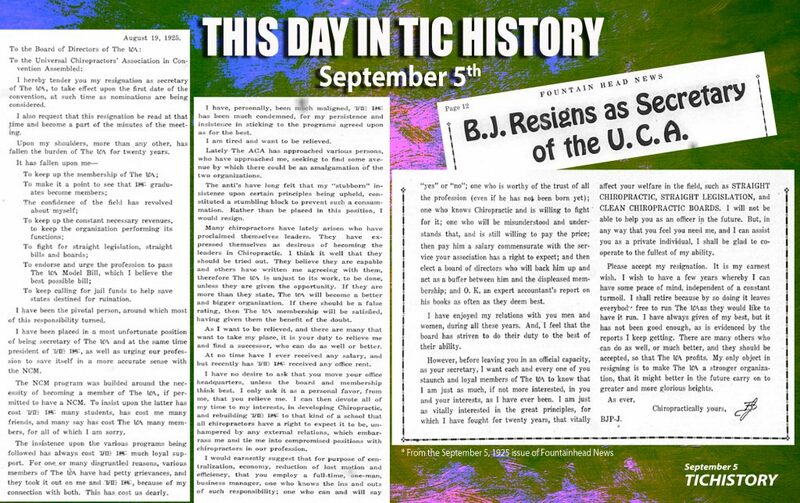 D.D.’s vitriolic attacks against B.J. are certainly evident in his 1910 text, but then, too, he raged against numerous chiropractors. D.D. named his text The Chiropractor’s Adjuster because he meant to give “an adjustment” to all chiropractors who did not follow his dictates. B.J. 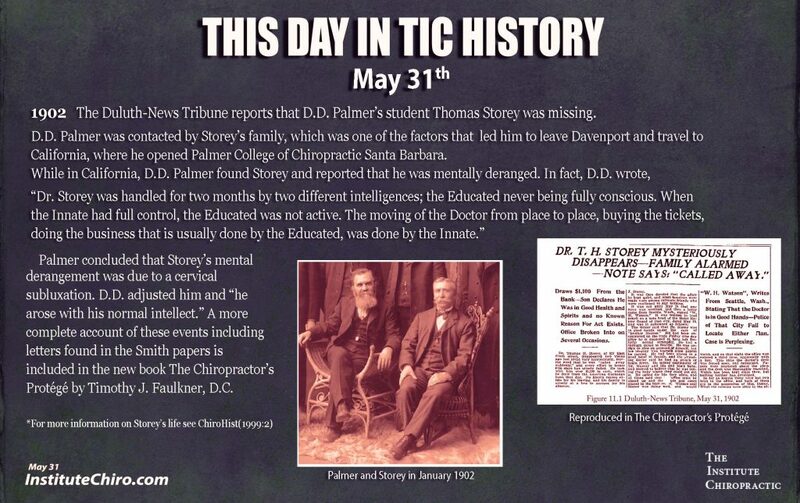 Palmer, however, gave complete credit to his father in all his writings. In my opinion, the profession owes its gratitude to B.J. for ensuring its survival as a separate, distinct healing art. It was B.J. 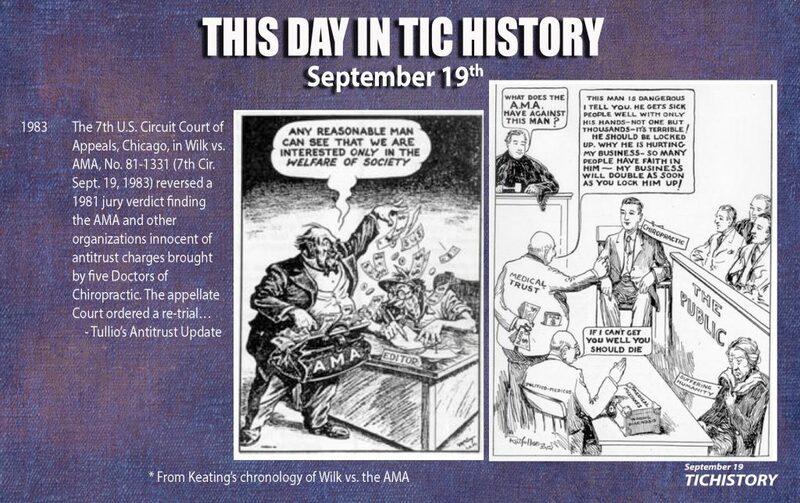 who fought the early battles to put the profession on track and defended its right to be licensed as a separate, distinct healing art. 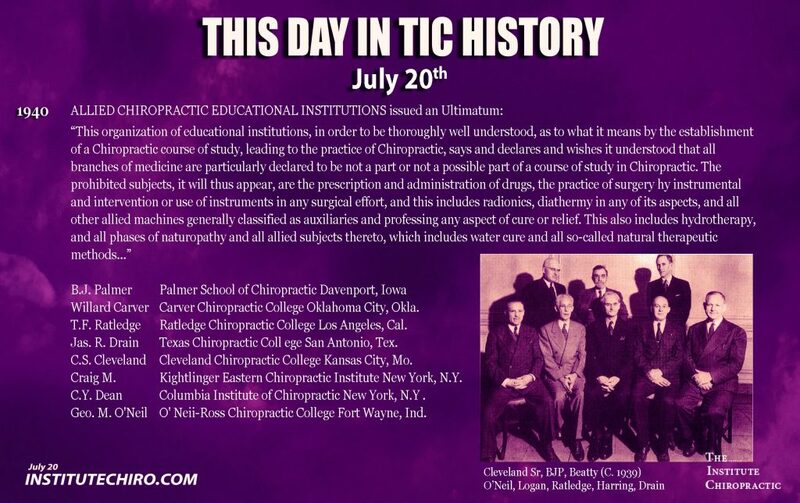 He developed and defined the principles of the chiropractic triune, Universal, Innate and Educated Intelligence, capitalizing the terms to indicate the higher order of their existence. They were, to him, the “God in Man” principle. B.J. 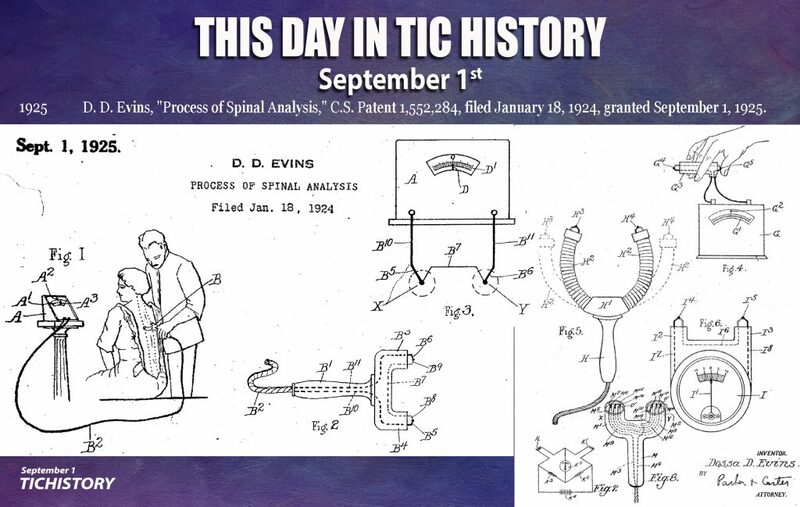 developed the Meric System, advanced the concepts of nerve tracing, and developed instrumentation, X-ray and spinographic procedures to the nth degree during his times. 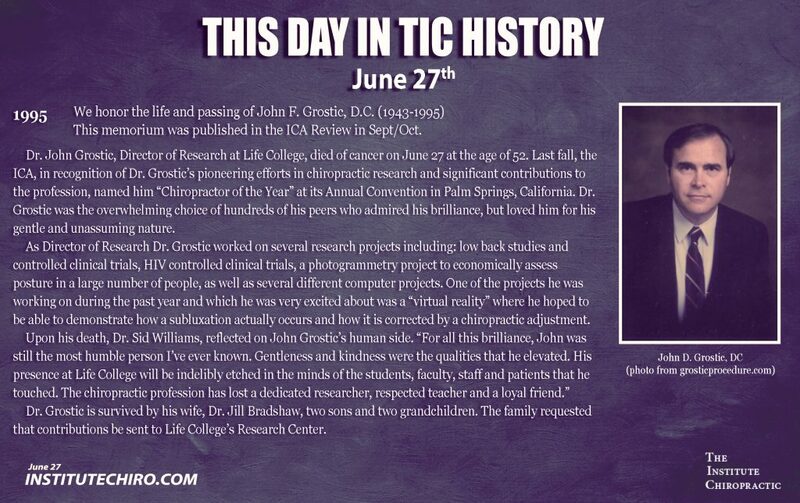 He brought forth the concepts of upper cervical specific chiropractic and created the B.J. 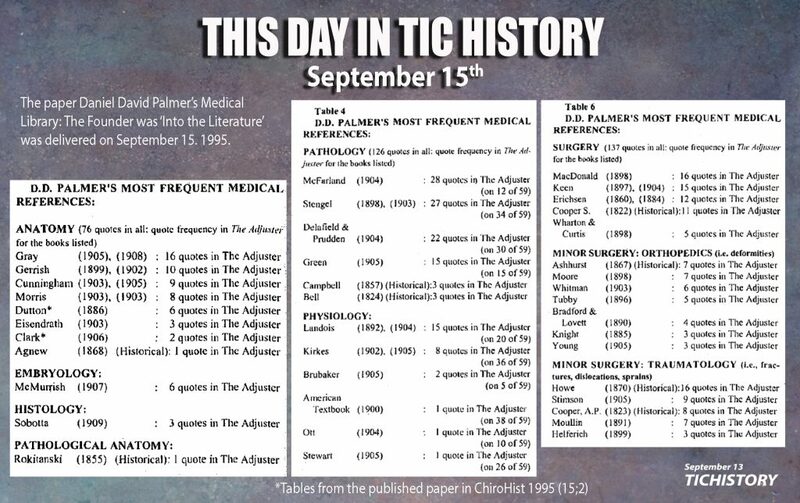 Palmer Research Clinic, where outcome assessment was thoroughly documented for a myriad of diseases. 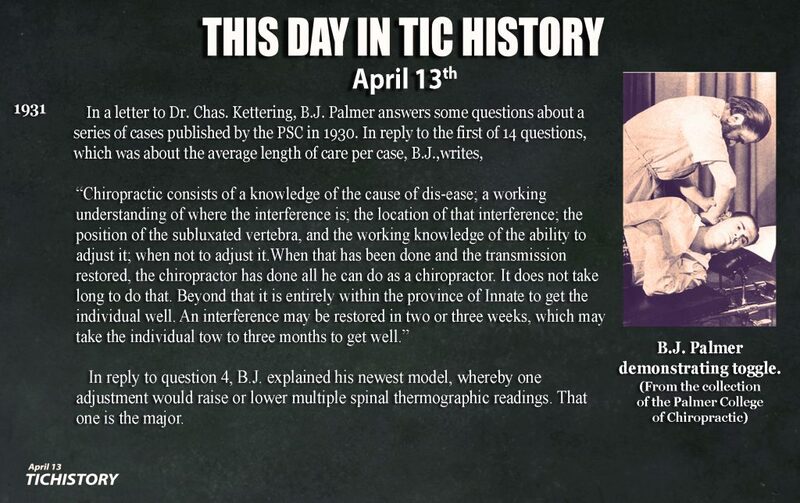 He had two medical doctors on the staff whose job it was to provide the diagnosis of ills, monitor body function and document the progress, or lack of same, under chiropractic care. 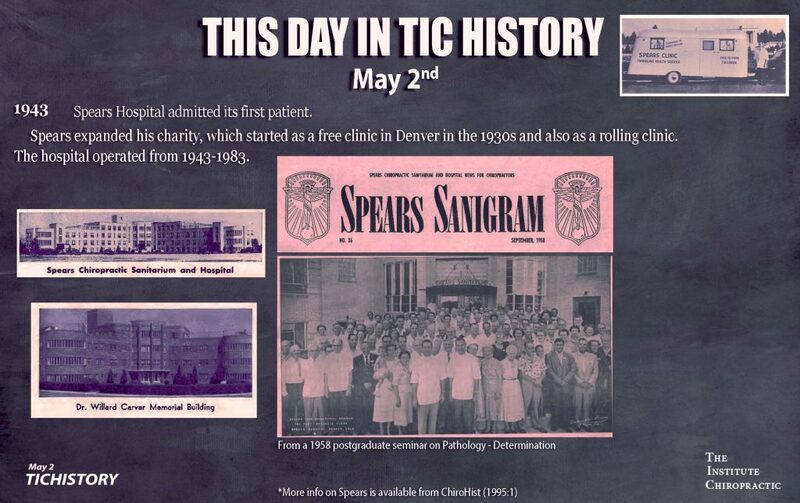 He operated the Clear View Sanitarium for chiropractic care of the mentally ill, and he developed rehabilitative procedures for the non-ambulatory patients in his research clinic. 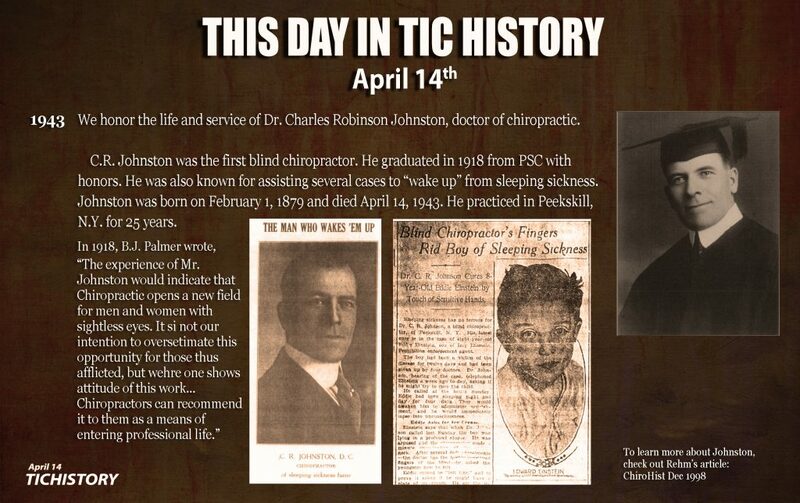 As the son of a chiropractor (Dr. H.A. Barge, PSC Class of 1923), I attended Palmer College homecomings (Lyceums) as a lad. 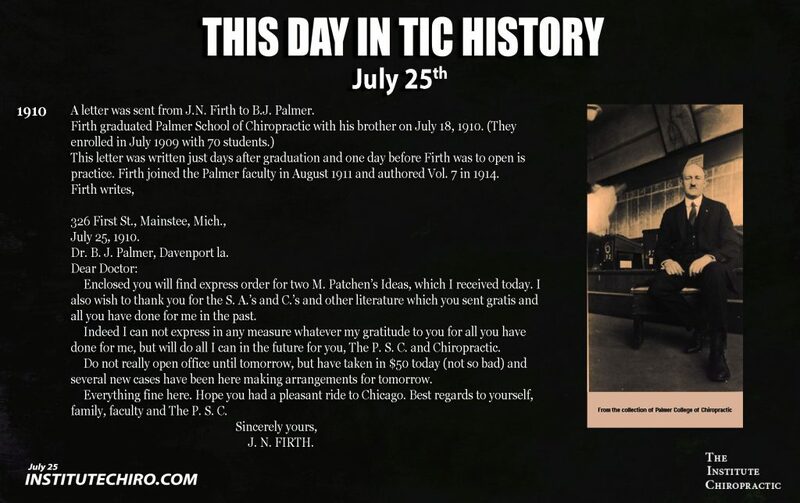 I was the ninth in my family to become a Palmer graduate, and when I was a student in 1951, B.J. Palmer became my teacher and my mentor. It was through his mentorship that the great philosophers of the 1920s, 1930s and 1940s came forth, notably Drs. Cleveland Sr., Thompson, Crowder, Parker, Stephenson, Firth, Gonstead, Price, Himes and Napolitano. Then, in the 1950s, Drs. Williams, Gold, Trout, Strang, Peet and Peet, Pierce, Stillwagon and many others. 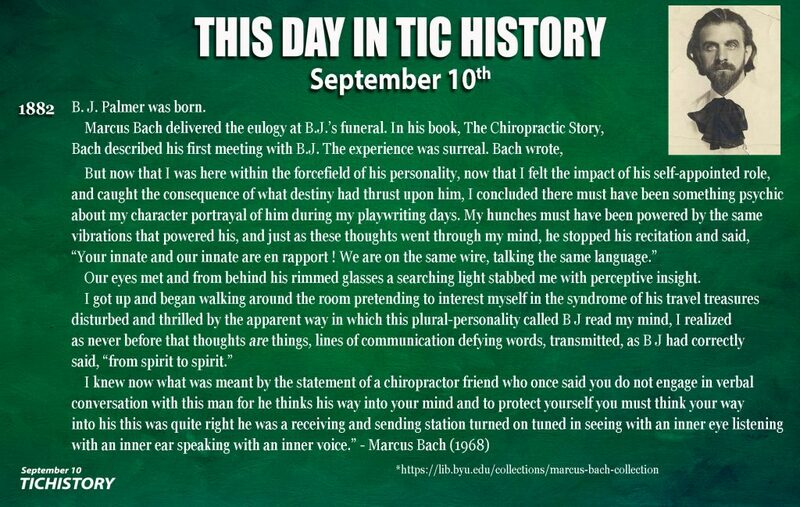 Most noted chiropractic philosophers today can trace their roots to B.J. Palmer and his college professors of the 1940s and 1950s. In this light, one of the most prominent of today’s chiropractors stands out. Taught and mentored by B.J. Palmer, Dr. Sid E. Williams is the leading contemporary proponent of B.J.’s “Above Down, Inside Out” Innate philosophy. 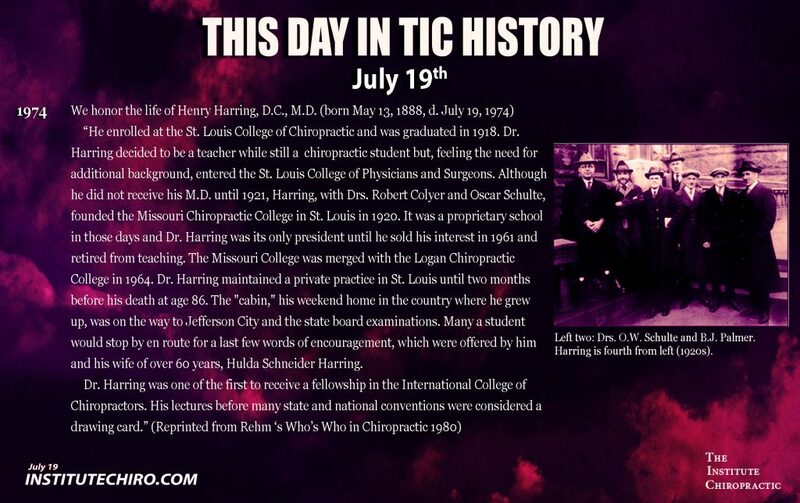 As the founder and president of Life College and its School of Chiropractic, the largest chiropractic institution in the world, Dr. Sid (as he is affectionately known) carries on the teachings of his mentor. Life College, located in Marietta, Ga., today has an enrollment of more than 3,000 chiropractic students and collectively more than 4,000 students on campus. The enrollment of more than 3,000 D.C. students in 1994 exceeds the high of B.J. 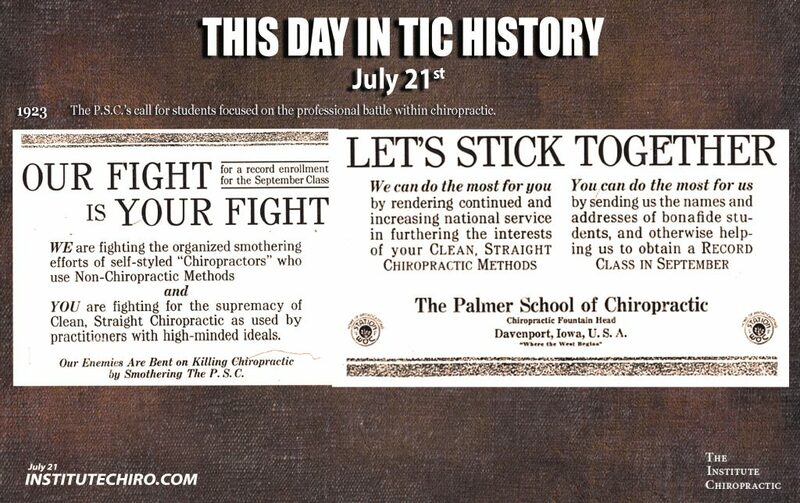 Palmer’s School of Chiropractic, which was 2,776 in 1921. 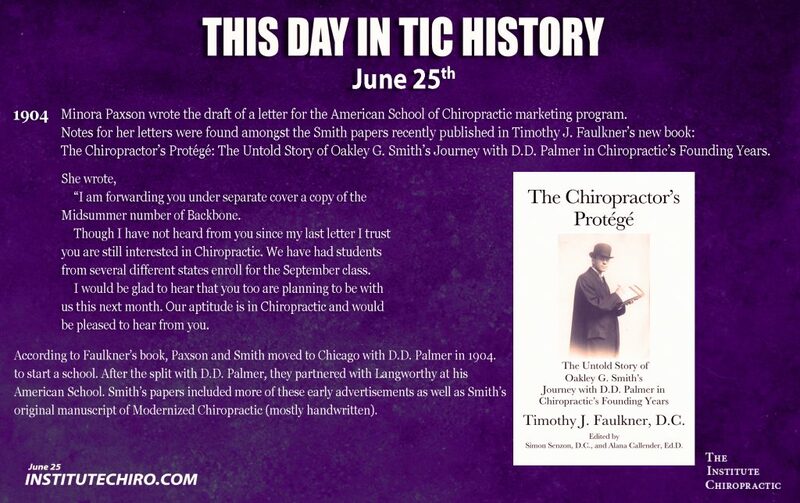 Dr. Sid graduated from the Palmer School of Chiropractic in 1956. 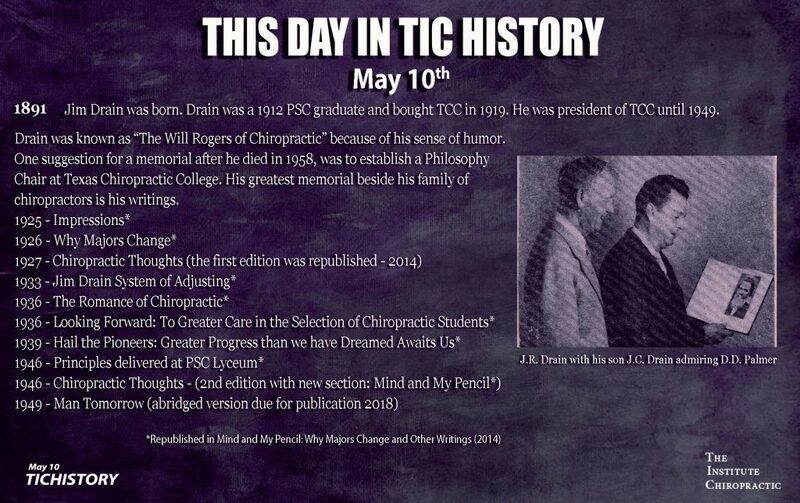 In 1964, he and his wife, Dr. Nell, who graduated with him, began a chiropractic seminar called “Dynamic Essentials (D.E. ).” Dr. Sid saw the need to perpetuate and renew the teaching of the principles, practice and philosophy of chiropractic. D.E. has been the motivational source that has brought many chiropractors into the full realization of Palmer chiropractic principles. Through his mentorship, the next generation of chiropractic philosophers are springing forth. 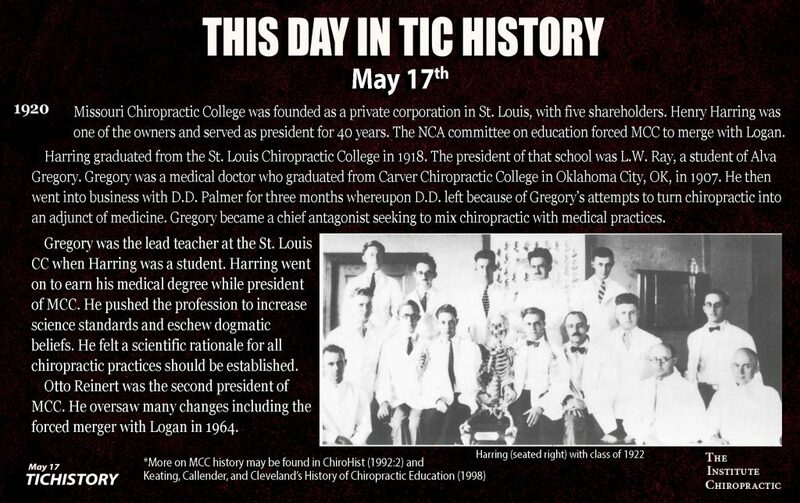 Graduating from the broad spectrum of chiropractic colleges, the names of those he has taught now grace the rolls of all state, national and college philosophy programs. So, through them, that which truly constitutes chiropractic philosophy will continue on. Chiropractic’s unique viewpoints on health care and disease prevention through the correction of vertebral subluxations, maintenance of normal spinal contours, restoration of neuromusculoskeletal and organic malfunction, and even advice on nutrition, exercise and healthy hygienic living, are well known today. But above all, in the practice of what is truly chiropractic, is the detection, location, analysis, control, reduction and adjustic correction of vertebral subluxations. The science of chiropractic has gained credence with each passing decade until today, as it stands on the brink of the total acceptance of its new health-care paradigm, which recognizes that dis-ease begins first as bodily malfunction . Malfunction then exhibits the symptoms, the physiological and pathological changes that we term disease. Chiropractic philosophy holds forth a concept of cause. It espouses the concepts of cause and cure in the following manner: There is but one cause in disease, the body’s inability to comprehend itself and/or its environment. There is but one cure in disease, the body’s ability to heal itself. And there is only one thing any doctor can do for a patient, and that is to remove an obstruction to healing, thus facilitating it. The concept of knowing the power that made the body can heal the body is a powerful source of succor in times of physiological stress. It eliminates the fear that destroys hope and thus it fosters recovery, knowing as we do that fear is the fuel that disease thrives upon. Chiropractic science teaches us that only when bodily malfunction takes place will the body foster disease, and we have a way to improve malfunction through the adjustment of the cause, the vertebral subluxation. Chiropractic care energizes the Elan Vital, the healing powers of nature, the “God in man” concept, some say. Today, verification of this sound, basic hypothesis is continually mounting. The correction of this interference restores “tone” to the human system, restores proper homeostatic equilibrium. In the words of Dr. Sid Williams, it provides “vivification” for the human body. Dr. Strang, president of Palmer College of Chiropractic, presents this thought on homeostasis: “We know that homeostasis involves negative feedback. We even know some of the mechanisms entailed. But this knowledge does not really touch the deeper mystery of how the body ‘thinks’ physiologically: Sensory information must be endlessly integrated and efferent activity determined. The stringing together of mechanisms cannot be expected to capture the overall reality of organic, dynamic activity. Classic mechanistic thinking is rooted in the notion that the parts explain the whole. This is true of mechanistic processes such as gearing or even electronic computing. But as Aristotle observed, nature is a world of purpose. In such a world, mechanisms are merely the instruments through which superimposing purposes work their wills. Above and beyond the subluxation in traditional and true chiropractic philosophy is Innate. Can we as a profession champion the teaching of these concepts? Belief once sustained us before the knowledge of our truths became apparent. If you glance at the shelves of any bookseller today, you will find a plethora of books espousing the concept of “The Healer Within,”– the “Above Down, Inside Out” true Palmer philosophy. And how will our traditional foe, medicine, respond to this tidal wave of facts? Adapt? Bend? Perish? Will it develop a new “outside, in” treatment, such as tampering with genetics? (1.) Palmer, D.D., The Chiropractor’s Adjuster, 1910, p. 784. (2.) Palmer, D.D., The Chiropractor’s Adjuster, 1910, p. 18. (3.) Palmer, D.D., The Chiropractor’s Adjuster, 1910, p. 668. (4.) Palmer, D.D., The Chiropractor’s Adjuster, 1910, p. 18 . (5.) Palmer, D.D., The Chiropractor’s Adjuster, 1910, p. 147. (6.) Palmer, D.D., The Chiropractor’s Adjuster, 1910, p. 491. (7.) Palmer, D.D., The Chiropractor’s Adjuster, 1910, p. 80. *Republished by permission by Today’s Chiropractic and the Barge Family. Personal “Thots”: Who Moves the Bowel? In the final analysis, the nervous system is responsible for all of the movements in the human body. In more ways than one, it motivates all of those who animate this planet. No drug can elicit a response in a dead body, and it is important for us to understand this fact. A laxative does not move the bowels; the bowels move the laxative, because they want it out of the body. No amount of laxative forced into the gut of a cadaver will evacuate its bowels. Life force must apply its forces to initiate a response to any drug. It is hard for me to understand that, today, when a renaissance in thinking in respect to health and healing is taking place, there are still those amongst us so mechanistically inclined to think that our vitalistic and metaphysical concepts are a hindrance to chiropractic progress. Just the opposite is true. These principles stand out clearly as the leading concepts in the avant-garde movement of the Westem World that is turning away from the therapeutic drug and surgery model of this century’s medicine. Countless medical authors and healers are espousing our philosophy today. Need I mention names such as Drs. Deepak Chopra, Dean Black, Andrew Weil, C. Nonnan Shealy, Bemie Siegel, Lasckow, Borsenko, Jaffe and more? Come on, fellow chiropractors! It is time to call up our philosophical roots and allow them to bask in the warm rays of the new enlightenment found today. As medical anthropologist Dr. R.A. Morinis has stated, we should: “Re-examine the place of philosophy in practice. 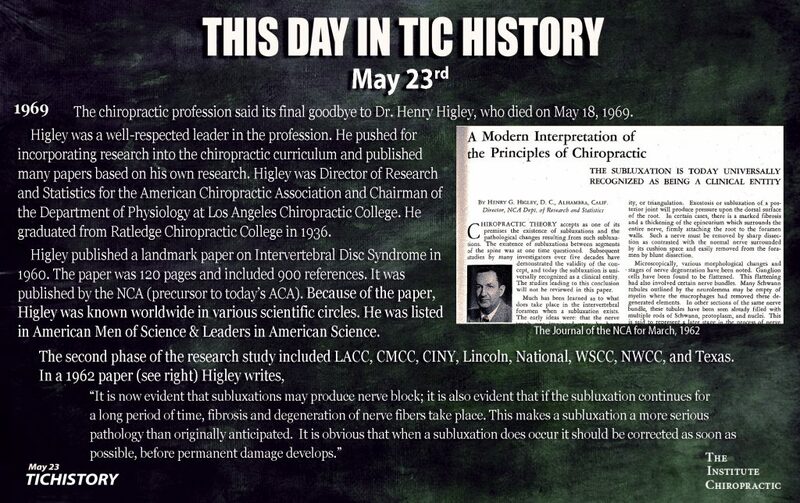 “Chiropractic theory has become a secret doctrine. It is something leamed, respected, and revered, but little practiced. The social pressure from medicine has brought technique to the forefront, and philosophy has slipped back as a result. There are two main implications of the demise of chiropractic philosophy. 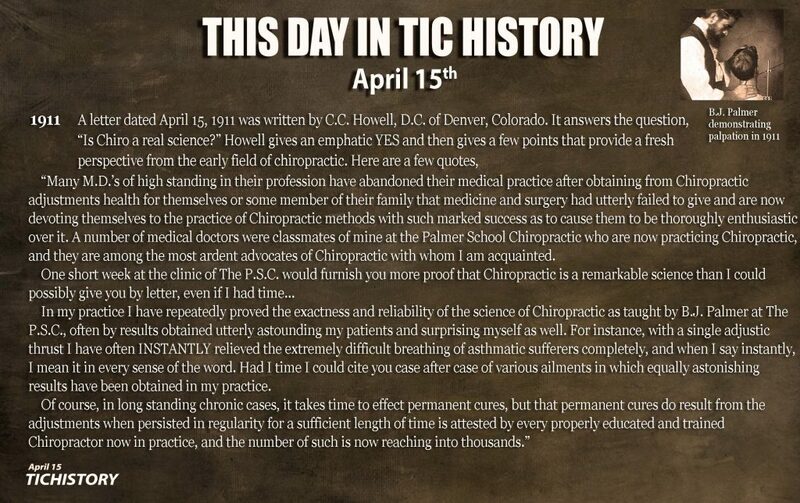 The first is the disappearance of that which is distinctively chiropractic. Having already begun to lose the exclusive practice of spinal manipulation to allopaths and physiotherapists, only the chiropractic philosophy significantly distinguishes the chiropractic practitioner. And yet the philosophy is kept hidden away. “In response to social threats to its existence, chiropractic has accepted the materialist world view of the allopaths. It has done so in fear of being labeled quacl<ery and this was undoubtedly a good strategy to follow at one time. I heartily agree with Morinis. It is time to call up our philosophical roots. No longer need we be ashamed of our advanced thinking. Why should we allow others, such as the aforementioned medical authors, to bring forth as new what is actually old to us? Chiropractic’s two distinct triunes are increasingly becoming conceptualized by the vast majority of the advanced people on this planet today. In the collective consciousness of the educated world, the great truths espoused in all of the world’s major religions that speak of a supreme force in life are certainly acknowledged. Our naming of this primordial source of all as “Universal Intelligence” transcends the barriers of religious prejudice. It speaks well to the depth of our understanding of life and explains that we revere that from which all life has sprung. Our concept of Innate Is openly accepted by modem man, and for those among us who still can’t grasp the concept, let them use the term nature instead, but Innate today is common in usage. Have we, as chiropractors, ever said it better? Yes, the concepts of Innate Intelligence are well accepted today. What about #3 in the chiropractic triune of intelligences, “Educated Intelligence”? Would anybody deny this unique attribute of the mind, particularly its advanced development in us Homo Sapiens? No, “enuf” said on that subject. Now, I have just spoken about the Chiropractic Triune- Universal, Innate, and Educated Intelligence- but what about our other triune, the “Triune of Life,” as taught in Stephenson’s 1927 Chiropractic Text Book, and later articulated in particularly fine form by Dr. Reginald Gold in Intelligence, Matter, Force? Egads, my friends, consider the “Mind” (Intelligence), “Body” (Matter), and “Spirit” (Force). Must I elaborate any more? These concepts are headlined by the majority of leading contemporary authors on health today. The Intelligence of the human body (Innate), motivates the body (matter), in all of its physiological functions through the “force” that flows through the nervous system (who would deny that today?). The link between intelligence and matter is life force, the “elan vital,” “GREAT SPIRIT.” Call it what you like. It is there! It is this force, Innate, that we chiropractors work with, as we release impediments to its expression caused by the neuroforaminal encroachment factors inherent in all vertebral subluxations. Need I say more? ‘Who moves the bowels?” Innate does!